For the 5th session of our Women & SSE seminar cycle, we wanted to address the issue of social protection, particularly with regard to the status of women and the SSE. It is an emblematic topic of many social struggles that remains a recurring concern shared by many citizens, especially in Latin America and Africa, the continents from which we asked our guests to share their experience. As our guests showed us during the webinar, SSE offers a legislative framework but also principles that facilitate awareness, the establishment of social protection systems and the regulation of working conditions. Our societies are still very patriarchal, and women are the most affected but often remain the most willing and able to engage in alternative solutions and become the founders of new models. Santiago Fischer (Belgium) – SSE as a promoter of fundamental rights …that are often neglected. Santiago is responsible for advocacy on the themes of decent work and the right to social protection at WSM -Solidarité Mondiale, an NGO that has been active for 20 years. Its 84 partners come from unions, SSE and youth or feminist movements. The heart of World Solidarity’s action is to demand access to social protection as a fundamental right, and to ensure decent working conditions. Its actions and support are both at the local level, by raising awareness among the populations, and at national or international level to act with the public institutions. In Latin America, the continent where Global Solidarity is most present (in addition to Asia and Africa), the informal economy constitutes the majority of the economic sector, yet is unable to ensure an egalitarian health system for all, to provide support for unemployed people or establish a pension system. One of the main difficulties is related to changing mentalities. Even though, historically, many social movements have been engaged in the defence of their social rights, the fact remains that many people are not yet sufficiently aware of their right to claim these services, to demand decent working conditions, and also to accept their duty to contribute to the social protection system. However, through the principles and values of social solidarity economy, there is a framework to raise awareness. Solidarité Mondiale encourages the promotion of social protection by inscribing its activities in the context of SSE, particularly through its training of social entrepreneurs, and implements some social rights such as equality between men and women. Good initiatives have an imporan scope, such as those of Gregoria Apaza, the Bolivian partner of Global Solidarity (testimony below). It is therefore vital to ensure better promotion of these good practices, especially given the difficulties encountered by some countries such as the Dominican Republic or Bolivia to implement the existing framework laws on SSE. Carla is the Coordinator of the Economic Empowerment Program of the Women’s Advancement Center Gregoria Apaza, which promotes equality and equity between men and women, and works on the establishment of a business incubator model with a social and solidarity approach. The organization Gregoria Apaza has been active for 35 years mainly with rural women, to settle in the upper part of La Paz. In Bolivia, and especially in the capital, where the majority of small and medium-sized enterprises (SMEs) have been located since the 1980s, women’s living and working conditions are often precarious. At national level, the State authorities propose some social protection measures, but they are “simply” based on the ILO’s 2002 recommendations, or reach as far back as the 1970s, in cases like the Labour Code law. In a society that has seen the proliferation of SMEs and precariousness, the difference with the current reality is glaring. Gregoria Apaza therefore seeks to operate on two levels: operational and strategic. At operational level, the activities focus on training to help women enter the labour market or become self-employed. Whether they become employees or managers of a small business, an important part of the training is based on the assurance of providing or benefiting from good working conditions by promoting access to social protection. By carrying out this work within the SSE framework, Gregoria Apaza shares principles and also creates a community of networks and specialists united through these values. It allows women to help each other, share experiences, advocate collectively or even participate in local markets. At a more strategic level, the actions aim to deal with small and medium-sized federations, to reverse the belief that the economy, since it is informal, is necessarily synonymous with precariousness and lack of professionalization. As for the demands made of the public authorities, Gregoria Apaza focuses on specific sectors, or particular situations, like that of divorced women who are often left without resources and without protection. It has made several proposals to revise the existing laws, and to ensure that the laws are operational. 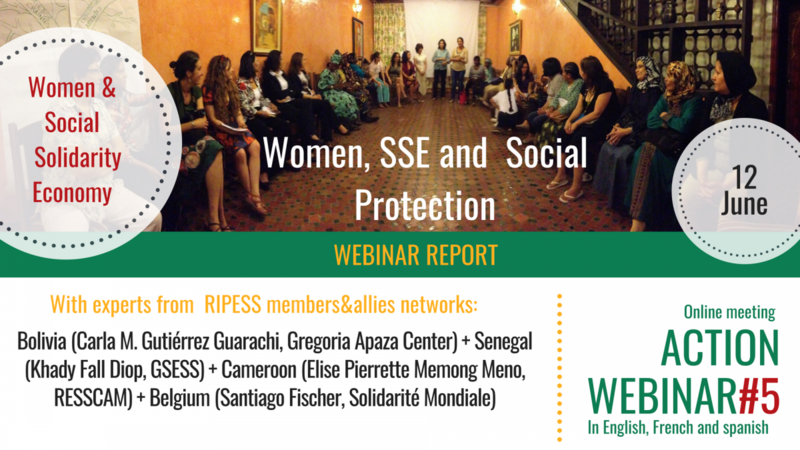 A human rights activist and gender expert, Pierrette is coordinator of the National Network of Social and Solidarity Economy of Cameroon (RESSCAM), and Secretary General of the African Network of Social and Solidarity Economy (RAESS), member of RIPESS. In Cameroon, the social protection system is divided between a contributory model for workers with a formal status, and a non-contributory model (World Bank, etc.) offering particularly subjective criteria. In total, only 10% of the population benefits from the contributory model with the majority therefore unprotected, mostly women and young people. Community solutions have gradually been put in place to overcome these shortcomings, particularly by women’s groups and in rural areas. These associations or cooperatives include “tontines” which have provided such things as school supplies for children, collective help for sick people or the buying of seeds. They even made it possible to put up street lighting on roads where women are usually victims of violence when they go home late at night. Pierrette concludes that the RAESS remains very attentive to the fact that SSE laws incorporate informal work, such as community initiatives like the tontines. It is essential for those initiatives to be fully recognized and supported by the public authorities. President of the Senegalese Group of Social and Solidarity Economy (GSESS, member of the RAESS) she works to strengthen SSE actors in Senegal, in particular by highlighting the best practices and bringing civil society together through socially responsible companies, political organizations, trade unions and universities. In Senegal, governmental measures offer very little social protection. A social security bursary system combined with the provision of medical coverage to beneficiary families (through mutual health insurance) purports to meet the needs, but these loans often create over-indebtedness of families. It is a profoundly unequal system that calls for alternatives. Women are also the most exposed, given their responsibility for the health and education of their children. We observe some encouraging results when mutual health funds are linked to a decentralized financial system, or mutual savings and credit. Experts conclude that while microcredit can help the poor rise out of poverty, micro-insurance for health can help prevent them from falling back into poverty. This system is commonly called “coupling”. New dynamics have also been taking shape since the Ministry of SSE and microfinance ws created. ). SSE intends to play its part in the discussions as a true promoter of employment, social inclusion and sustainable development through the second Axis of the Senegal Emergent Program (PSE. The GSESS is working closely with the Ministry to highlight the need to promote the role of women in the management and repayment of loans.